Vienna is the capital of analog lifestyle. I will take you on a tour to the best shops for analog photography and end it at the palace of analog craziness. Did you know that Vienna is the capital of analog lifestyle? 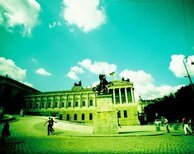 No other city offers such a wide range of special shops for analog photography, goods or headquarters of the most reknown analog photography brands like Lomography or Impossible. On this tour I will take you to right into the heart of the 7. district where all the vintage photography shops are situated, tell you about the current analog movements in Vienna and end the tour with a visit in the new analog headquarters called Supersense where you will meet the founders of Impossible in person. "Supersense" is the ultimate shop for analog enthusiasts and all the people who join me on my tour will receive a special gift: a 5% percent discount on their purchase at Supersense and the opportunity to have a wonderful cake, best coffee and a Polaroid picture souvenir for a special tour price.